When I woke this morning I decided I was going to move on to somewhere else, as I have a couple days before a start a bigger adventure next weekend. In the meantime it's time for some different scenery. By my estimate there were about 5% of the RTR folks left. 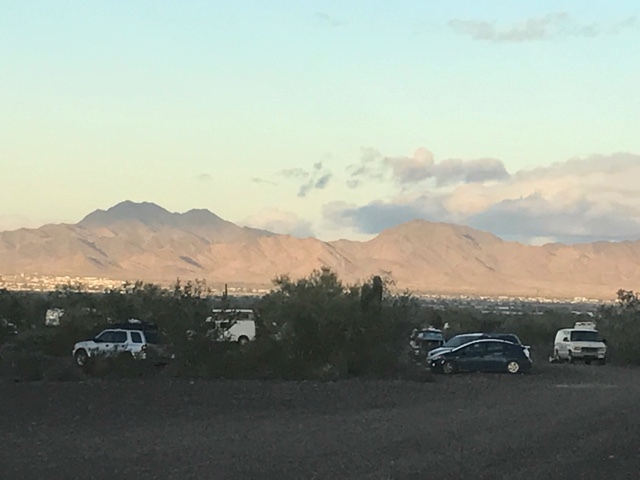 First, before leaving Quartzsite, I wanted to get a hike in. This location where the RTR is held is an excellent place to get out for a walk or hike. Where I'm going it is not as interesting. Today, as I walked up to the area around the gold mine I decided to take a branch off the main road to another BLM ATV trail. 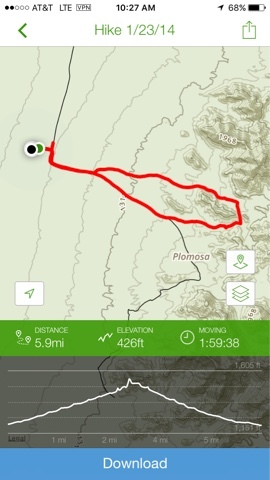 I checked my hiking software and I thought it connected to the road I hiked to the stone house. I knew I could make a loop back to camp. Above is the treck I took over a hill separating the canyon with the stone house and the mine. If you come out here you can get a map from the BLM Office. I use my map software on my phone. 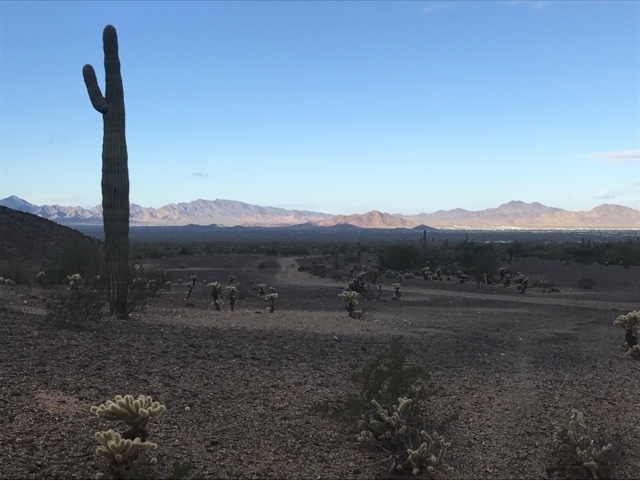 Most BLM roads are listed as trails. 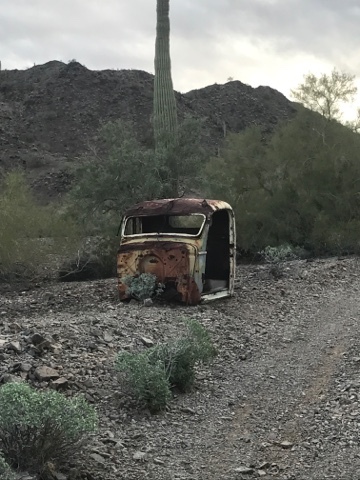 Since this is an old mining area you will often see relics and test holes and mine holes. 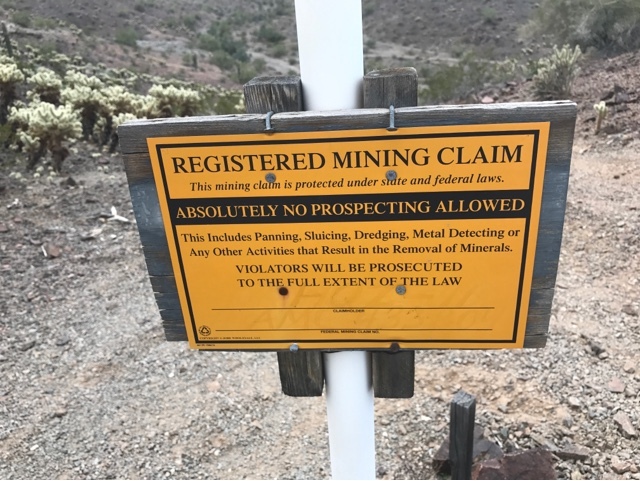 Mining claims are marked this way. 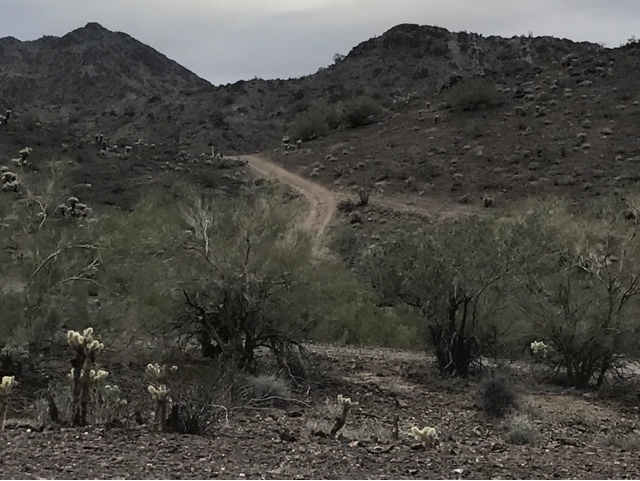 It does not mean you can't walk or ride on trails and roads, but it does mean you can't stop and pick up any rocks or minerals. 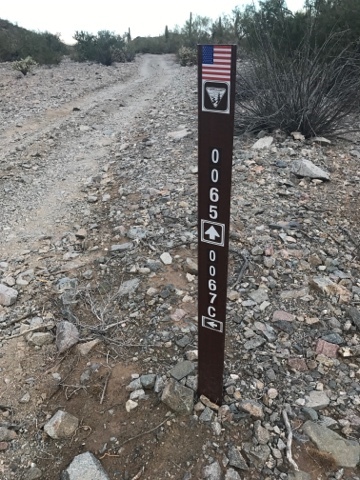 Most BLM Land have road markers like the one above that correspond to their maps. They may include information about land usage. I'm hiking in the mountains to the east and its totally cloudy and no sun. Good thing as I didn't bring any water. Typically if I plan to hike over 3 miles I bring water but today I forgot and luckily it worked out being cool. The picture above is to the west where it has been sunny all morning. 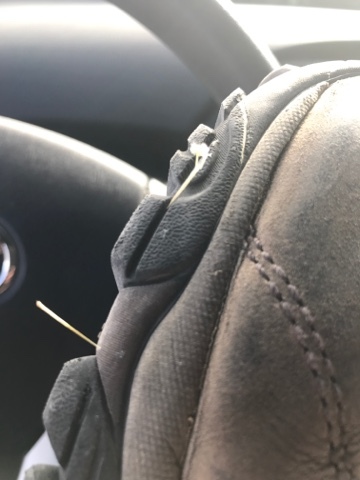 When I got back from the hike I checked my shoes for cactus needles and I had 2 of them stuck in my sole. I spent an hour this pm sewing the Velcro dots I stick to my curtains to hold them from coming off the material. 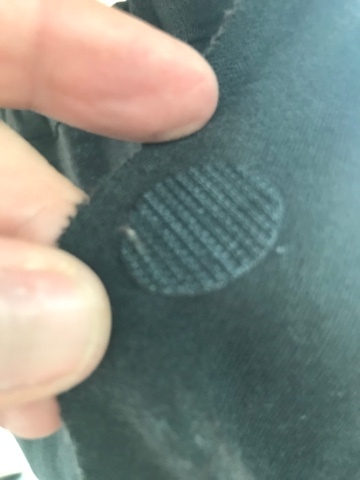 Overnight they have been some of the Velcro dots that have come unglued causing gaps in my curtain edges. I'm just tacking them on as the glue on the backside of the dots gets stuck to the needle and thread so I had to use alcohol wipe to wipe it off between sewing the dots. All in, how much water are you going through in a day? I actually looked at my water usage at the RTR and drink about 3 quarts a day especially when I do my long walks and I use a quart for other things, such as washing up and some minimal amount for dishes. My rule of thumb is a Gallon of water a day and that works good for me. I may or may not wet shave every day but definitely every other day. I wash my hair every other day and that's the day I fully wash my body. This is all calculated into my 1 gallon a day usage. What can occur is when it's hotter I will drink more. When I cook things like spaghetti there is wasted water. My new rice cooker allows me to steam vegetables vs boil or if I'm making soup I can just put the veggies in the soup and cook saving water. It is possible to conceive more as I have learned from others. I will blog abou some of those things in the future.